Release Date: 2000 Running Time: 102 Mins. “This land of Israel is bought with pain,” says Michal, the settlement rabbi’s nymph-like, much-desired daughter, as she looks out on the sandy mountains of the West Bank. Romantic love and patriotic love are both full of pain in director Joseph Cedar’s engrossing film. Combining a blockbuster’s action and suspense with the creative quirks of an independent film, Time of Favor caters to a wide audience. Menachem, a handsome, stoic soldier in the IDF, is offered his own unit, made up of fellow students from Rabbi Meltzer’s West Bank Yeshiva. At the same time, Rabbi Meltzer plays matchmaker with his daughter and his star student, Pini. It’s no surprise that Michal, strong-willed and independent, prefers Menachem’s silent strength to Pini’s over-anxious intelligence. The love triangle knots up and the political tension rises until everyone’s allegiances are tested in the film’s gasp-worthy climax. These political and romantic tensions play out amongst the breathtaking landscapes of the Holy Land. Moving from the barren dessert to a secret underground tunnel system, the setting alone grasps the viewer’s attention as the characters bathe in underground pools, run through 1800-year-old catacombs, and pray on large spreads of earth, where barren nature impresses a sense of spiritual solemnity. Not a typical beauty, Michal’s dark penetrating eyes grace what might otherwise be considered a homely face. What makes her beautiful is her brooding spirit. Despite her delicate frame, she seems tough enough to defend herself against any big-biceped fighter. In fact, commanding soldier Menachem finds himself taking orders from her, while a bookworm like Pini buckles to her sharp mind. Cedar’s Religious-Zionist upbringing is apparent in this film that delves deeply into Orthodox Judaism. 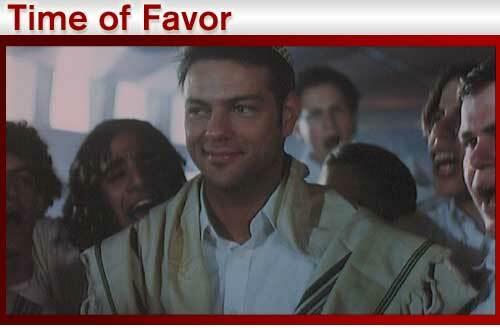 Time of Favor handles the Holy Land with impeccably high regard and maintains a sense of solemnity throughout. The importance of prayer and tradition in the lives of the characters is stressed. Soldiers dressed in full uniform break from their training to open prayer books and raise their voices to God. The Rabbi’s religious authority marks him as a strong influence on his community. He is trusted and respected, and his students, with total faith in him, follow his every wish. While showing respect for Orthodoxy, Cedar’s film simultaneously raises questions regarding the foolishness of religious-fundamentalist certainty. In Time of Favor, headstrong convictions have reckless and dangerous results. Rabbi Meltzer is certain he knows what’s best for everyone around him, but his willful behavior twists the plot into dangerous knots. Also full of stubborn certainty, Pini and Menachem leave no room to doubt the paths their lives are to take; so, when reality doesn’t match their expectations, they continue to bulldoze through life blind to the obvious truths in front of them. 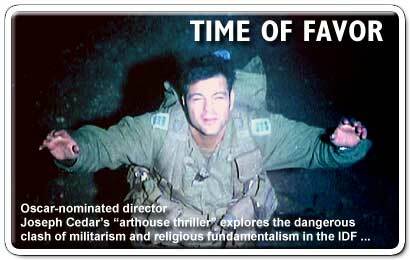 Time of Favor explores the specific consequences of religious fundamentalism of taken too far in the West Bank, but the questions it raises about love and patriotism hit the universal note that makes this film a recent classic of Israeli cinema.